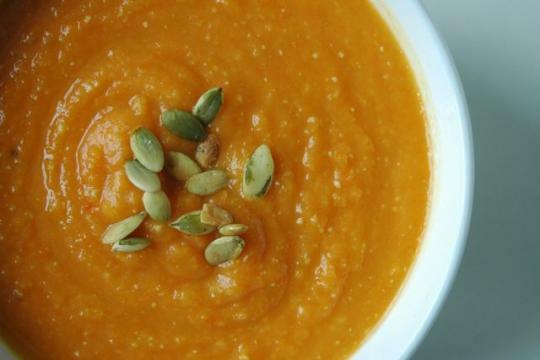 Everything I make from this cookbook is delicious, and so I pass on this simple and dependable squash soup recipe. It is a quintessential New England fall soup. I made a vegetable mushroom broth for the soup stock which gave it a real fullness. Warm oil in heavy -bottomed 3 quart pot. Add onions along with 1 teaspoon of salt. Stir occasionally, and cover on and off for 10 minutes so some moisture develops. Add ginger, cinnamon, garlic, and sage. Cook for 5 more minutes. Stir in apple cider and bring to a boil. Add the squash, carrots, and 4 cups of water or vegetable broth. Bring to a boil, then lower heat, cover, and simmer for 20 minutes, or until the squash is soft and falling apart. Remove cinnamon stick and puree with a handheld mixer until the mixture is creamy. Add additional cider and salt and some freshly ground black pepper to taste.